In the real world SAs often need to configure many hosts the same way. Rather than install each host manually, most Unix or Linux systems allow an automated install. The SA installs once host manually (interactively), then saves the answers to the questions asked, in a file. This file can then be used to automate the install on other hosts. In a datacenter, cloud, or cluster (enterprise) setup with many hosts, a minimal install is done, often with a pre-created disk image file. Later, configuration management tools are used to install and configure any additional software and services. Different vendors use different names for this process. Sun uses JumpStart (for Solaris) while Red Hat uses KickStart for RHEL and Fedora. In this project you will use KickStart. Although we went over this in the Admin I course I expect most students will have forgotten about this by now. Use the information location techniques you have learned to find information about KickStart on the Internet. For such an install, the new system needs a boot image it can use to run the installer (Anaconda for Red Hat like systems). This can be supplied using a PXE boot (the BIOS initializes a NIC using DHCP, which also downloads and then runs the boot image and installer). For computers without PXE support (or a classroom lacking an appropriate DHCP server), you will need to use some sort of boot media in the target host. The KickStart file must list the URL (or pathname, if the packages are included on the boot media) of the repository to use, as well as a list of packages and/or package groups to install. For the projects in this course, we will refer to the first host as “Server A”, and the second host as “Server B”. Note! Installing from a “Live” CD or DVD will not create the same system (and hence, not the same KickStart file) as installing from a normal “install” CD/DVD. Experience has shown Server A should be created using a normal “install” DVD rather than a “live” one, or you may need additional changes to the resulting KickStart file. So don't try that. First, gather system information for your assigned computer(s). It may have changed since last term! Next, plan your hard disk partitioning scheme. I strongly suggest using the ext4 filesystem type, and not the default of XFS. You will need to have a /boot partition and a /home partition at least. Make sure the root partition is large enough to hold all binaries and configuration files that you will put in it, plus room for more later. 15 GiB is a reasonable minimum. Later in this course you may need to create large disk image files, make sure you have space for them. You should use a default network (DHCP client) setup, and use an initial firewall that blocks nearly everything, but should allow SSH and HTTP (at least). If you fail to do this, the KickStart file won't be accessible from Server B and you will need to make a firewall hole later (or temporarily turn off the firewall, not generally a good idea, but safe in our isolated classroom). To disable the firewall temporarily, run the command “systemctl stop firewalld”. (Note this assume you have the default Fedora firewall running; if you're running iptables or some other firewall instead, just turn that off instead. You should enable SELinux during the install. However you may initially configure it for permissive mode, as long as you set it to enforcing mode in your post-install steps. I would suggest adding an extra Yum repository to include some extras that Red Hat doesn't include by default, due to licensing issues. Consider adding rpmfusion.org (both free and non-free repos). Finally perform any other post-install steps you see fit. (See a list of post install steps for some ideas.) I would suggest setting up printing at least. What changes did you make to the initial (default) setup? Install the Apache web server using its default configuration on Server A. You will need this to serve your KickStart file to the other hosts that will use a network KickStart install. Be sure your web documents are accessible on the local LAN (that is, check your firewall and other security related configuration). What did you need to change, to allow your second host access to your web service? Create the KickStart file by following the steps below. Fedora creates a sample KickStart file based on the options that you selected during installation, and saves it in the file /root/anaconda-ks.cfg. You can use this KickStart file from your first host's install as a starting point. Note, however, it is incomplete. Read the KickStart Guide for details. 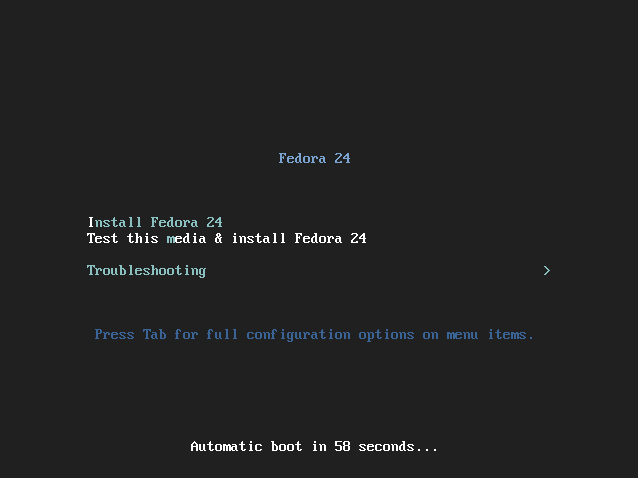 See also the Fedora Kickstart documentation (part of the Fedora installation guide). Those links are supposedly to the latest KickStart documentation. However, the technical details are not in the Fedora guide at that link. Use the Fedora KickStart syntax Reference (or your Fedora version) appendix for the technical details. You will have to edit the generated KickStart file (but make a copy first; see the Hints section below), by adding a URL to your repository (and other missing elements), and the list of packages to install, as shown in the following steps. Over the years Red Hat has made incompatible changes to the KickStart file syntax. Be sure you find the documentation for the current version! A sample anaconda-ks.cfg file is provided as a guide, but don't use it; it is for a particular version of Fedora and may not work with your version of Anaconda. In addition, the disk partitioning is wrong, the user account created is “wpollock”, and you won't know the password or the root password! While it is common to use a network (PXE) boot with KickStart, this requires you to have or setup a DHCP server and, for your own custom repository, an NFS or HTTP server on the first host. Instead, you will boot using the Fedora Install CD-ROM and obtain packages from a standard Fedora Internet repository. In your KickStart file, you must specify a URL from where to download packages. if not already in there. And it won't be in there usually, since the default is to use a network install and the closest mirror on your Server A. In that case, there is no installation source and no repos listed in the generated KickStart file. If you don't want to use the closest mirror, you can specify a specific mirror site to use. In the KickStart guide, look in the “install” section for a list of mirror sites; pick one. Pick some geographically close repository (USF if listed), from the list at mirrors.FedoraProject.org: click on the correct architecture link in the row for your Fedora version (i386 or x86_64). Make sure the mirror you select works (by visiting the HTTP link for that mirror). Edit your KickStart file to make any additional desired changes. For example, you could install extra packages, configure services (such as httpd to start at boot (that is, the service is enabled), and so on. You should take a few minutes to see what else can be put into the Fedora KickStart file. List your final KickStart file. Place a readable (in the Unix permissions sense) copy of your KickStart configuration file under the document root of your web server. What is the URL of your KickStart file? Verify you can read the file using a web browser, using the IP address of your first server in the URL. (And NOT “127.0.0.1”!) How did you determine your host's IP address? Without a PXE boot ability, you will need to use bootable media on the target host. You could create and use custom boot media such as DVDs, or USB disks. While this can be difficult, feel free to try; you can find directions at FedoraProject.org/wiki/FedoraLiveCD/LiveCDHowTo or FedoraProject.org/wiki/How_to_create_and_use_Live_USB. For this project, you can't use a Fedora Live DVD. This is because (any type of) Fedora Live DVDs don't actually contain grub! They use a replacement boot loader called “liveinst” which doesn't support network booting as does grub. As mentioned above, you can make a custom Live DVD by modifying the image and burning that to a new DVD. However it will probably be easier just to use a different “network install” version on some media (such as a DVD). When the system starts to boot from the install media, you may need to type something to get to the “boot:” prompt. With Anaconda (the installer used with Fedora), hit the “escape” key when the initial screen appears. Make a copy of your system journal pages that document in detail the Linux install done in class, including any post install steps done. Note that including a copy of a KickStart file used for the install in the journal is a good idea! The system journal is a vital document that is used frequently for documentation of changes and of work performed, for accountability, and for trouble-shooting. For this class you can use a wiki to host your system journal. Create (if you haven't done so previously) an account on the class wiki: YborStudent.hccfl.edu/UnixWiki. Then edit and create pages as necessary. (Use the help link for page creation and editing help.) What is your account name on the wiki? For this class you can use the class wiki to host your system journal. You can edit and create pages as necessary, under your “user” page. (Use the help link for page creation and editing help.) Keep in mind that your wiki pages are publicly readable. Write down every step either before you try it, or as you do it. You will never remember exactly what you did, later! If you stick to command line tools, you can use the script command to record every keystroke you type and all output. (You can also use the history (or fc) command to view the commands you entered, and copy them into your journal.) However this command isn't available for the install step, so you should either use paper and pencil, or use a second computer to work on your journal. You should record everything, even the steps you un-do later! You can always clean up the journal before creating management reports (or before you turn it in to your instructor for grading). Keeping an accurate and complete journal is a common requirement for all engineers, not just system administrators. Before making any changes to configuration files (such as those under /etc), make a copy of the current version of the file. Then when done playing with the file and all is working again, you can copy the output of diff to your journal, to show what changed. The KickStart file must be named “ks.cfg” and must be located in the boot disk's top-level directory. Since Linux boot disks (and USB flash disks) are in MS-DOS format you can copy the KickStart file under Linux using the mcopy command (part of the mtools package). If using a bootable DVD instead, first create the directory structure used for a bootable DVD, then copy the ks.cfg KickStart file to the isolinux directory. Then create the file.iso image file. Finally burn that image file to a DVD. Now boot the system you wish to setup, using the modified boot media. Enter the command “linux ks=floppy” at the boot: prompt. If using a USB flash disk, use the command “ks=hd:device:/ks.cfg” instead, where device is the name of your USB drive (e.g. sdb). With a bootable DVD, use the command “linux ks=cdrom:/ks.cfg” instead. If you were to use a network KickStart install you would still need a boot DVD/flash disk. However it wouldn't need to be modified from a standard boot image (no KickStart file need be added). A copy of your journal pages, and a copy of your final KickStart file. You can send as email to (preferred). If email is a problem for some reason, you may turn in a hard-copy. In this case the pages should be readable, dated, and stapled together. Your name should appear on the first page. See the System Journal Hints section above for more details.